Hangzhou City Guide. China Travel Services. CTS. Los Angeles. San Francisco. Hangzhou has long been a tourist destination for Chinese travelers attracted to the beauty of West Lake, and is now becoming a favorite spot for international travelers. The widely expressed Chinese proverb, "In heaven there is paradise and on earth there are Hangzhou and Suzhou", combined with the words of Marco Polo describing this area as "the most beautiful and magnificent city in the world", have helped to make Hangzhou one of the most popular tourist attractions in China. Fortunately, while any city would struggle to live up to a reputation as "paradise", Hangzhou has retained its beauty in modern times. Despite the idyllic preconceptions one might have before arrival, it is hard not to like this city. 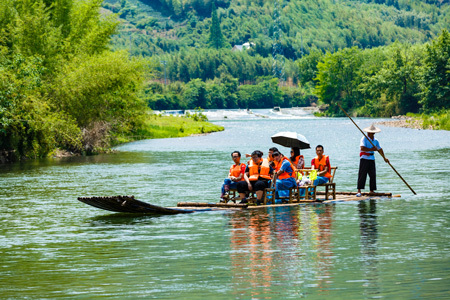 Even the most seasoned traveler will appreciate West Lake for its scenic beauty. Hangzhou is a city with a rich history and culture spanning more than 2000 years. The city first made a name for itself in the sixth century, when the Grand Canal opened up and linked the area to other centers of trade such as Suzhou. The Song dynasty helped to make Hangzhou famous when they moved the imperial family to this area in the 12th Century. With its inviting views and outstanding scenery, West Lake soon became popular with artists, poets and painters seeking inspiration in the solitude of this "paradise". The city's nightlife at the moment tends to center around the Paradise Rock Bar, which is right next to the Overseas Chinese Hotel on Hubin Road. The drinks in this bar are inexpensive, the decor is simple, the food is tasty and the live music is usually excellent. Hangzhou is currently producing some of China's best live musicians so a night out on the town will probably encounter either an organized or impromptu "jam session". It makes for a great atmosphere in the bars and clubs and there is a welcoming friendship in town among the sizeable foreign student population and the local students. There are numerous bars around town worth checking out including the Lake of Dreams on the southeast corner of the lake and the New L.A. Disco on Qing Chun Road with a flexible bouncy dance floor. Hangzhou has a surprising amount of intimate bars and clubs for a city of this size. The most popular evening past time remains, however, the typical Chinese experience of walking around or along the shores of West Lake with your partner in the moonlight. Ignore the children selling red roses or you will be pestered until you purchase a rose. Hangzhou also has a few other entertainment attractions including two championship level tennis courts and a Golf Club. As usual in the smaller cities in China, it's worth checking out the big hotels such as The Shangri-la to see if they have any special events organized. The Qiantang River tidal bores are a major event of the natural world. During the tidal period, heaven and earth are merged into one and the foaming waves surge forward with a deafening roar, reaching a height of several meters in the shape of steep mountain cliffs. The spectacular scene has resulted in an annual wave-watching festival that dates backs to the Han and Tang dynasties. The festival opens with a full-length variety show of songs and dances by folk artists and guest performers from minority ethnic groups. During the festival business negotiations are sponsored and folklore shows are organized. While waiting for the bell to ring at the Jingci Monastery to usher in the new year, onlookers are entertained with lion dances and acrobatic shows. The waters of West Lake are busy with pleasure boats in the evening, on which concerts of traditional stringed and woodwind instruments are performed, while a monastery in the nearby Nanping Mountain rings in the New Year with its bells. The extraordinary tidal surge of the Qiantang River is a world-renowned natural wonder caused by a combination of the gravitation of the celestial body, the centrifugal force produced by the rotation of the earth and by the peculiar bottleneck geography of Hangzhou Bay. A tidal wave is sometimes created by the bores surging into the river with the momentum of an avalanche as a magnificent and breath-taking scene. One time the tidal wave reached 8 meters high. An annual ritual takes place on August 18 of the lunar calendar year, which is the traditional tide-watching day when people throng to the Qiantang River to watch this amazing natural wonder. The observation area is at Yanguan Town where spectators can also have a glimpse into traditional Chinese culture by visiting many other historical sites, such as the Sea-Pacifying Pagoda, the Temple of the Ocean God and Zhongshan Pavilion. Hangzhou's fame rests mainly with picturesque West Lake, so named because it is located on the town's western fringe. The 6.03-square-kilometer West Lake, with water surface totaling 5.66 square kilometers, has five sections: the Outer Lake, the Inner Lake, the Yuhu Lake, the Xili Lake and the Lesser Nanhu Lake. The Outer Lake, the main body of West Lake, has three small islands: Three Pools Mirroring the Moon, Mid-Lake Pavilion, and Master Yuan's Mound, which are reminiscent of the sacred Penglai Island in the Bohai Sea. The scenic zone with West Lake at its center is home to forty or so major tourist attractions and thirty sites of historical interest, but no tourist should leave Hangzhou without seeing what are called the "Ten Sights of West Lake". As the result of generations of efforts, many ancient buildings, sculptures, temples and gardens have been introduced into every nook and cranny of the lake, complementing the natural landscape of water, wooded hills, caves and springs. Solitary Island (Gu Shan) sits in the northwest corner of West Lake. This is the largest island on the lake and an ideal place to wander and explore. Views over the lake from its banks are spectacular and there are a few places of historical interest scattered about the island itself. On the north side of the island is Wenlan Pavilion, the pristine and peaceful Zhongshan Park and the Zhejiang Provincial Museum, which is actually part of the original imperial palace. To the west of the island and at the top of the small hill is the Xiling Seal Society. The tomb of Qiu Jin, a female revolutionary, is at the foot of the hill. Qiu Jin was an early pro-democracy campaigner and part of Dr. Sun Yatsen's team of fighters in the 1900s. The pavilion known as "Autumn Moon on a Calm Lake Pavilion" was built on the northeast part of the mountain, in memory of the reclusive poet from the Song Dynasty, Lin Hejin. Legend has it that the poet believed the blossom on the trees was his wife and the crane was his son! The Bai Causeway is the shorter of the two causeways that cross the lake and measures about one mile long. This causeway travels northward and starts at the "broken bridge", traveling through the "golden ribbon bridge" and ends at the "autumn moon on a calm lake", which makes it a very interesting journey. The Su Causeway is the longest series of bridges crossing over Hangzhou's West Lake. The causeway is named after the Song Dynasty poet, Su Dong Po, who was then the governor of Hangzhou. The causeway runs across the lake from Nanping Road, to the "Lotus in the Breeze Quyuan Garden". The causeway consists of six simple yet beautiful bridges and the embankments along the way are all landscaped with trees and flowers. In the evenings, the causeway is illuminated by green lights and this is a favorite place for Chinese couples to promenade. The most pleasant way to travel to this outlying island is by boat. Xiaoying Island was built in 1607 using silt from West Lake. Once you are on the island, you will discover smaller lakes with their own small islands. The entire island is dotted with pavilions and platforms, with the smaller islands being linked by bridges and railings. At the southern-most tip of the island is the pavilion of "Mutual Affinity", which affords great views over Santayinyue Lake. The name of this lake means "Three Flags Reflecting the Moon", as the three flags (actually pagodas) are said to reflect the evil spirits that may be hiding in the lake. Huagang Fish Pond is situated in Lu Garden at the foot of Huajia Hill, which is on Solitary Island between the Su Causeway, Yinbo Bridge and Solan Bridge. It was originally used for fishing, and now is a huge pond filled with brightly colored fish. The pond is a lovely place to rest under shady trees. "Lake Under the Autumn Moon" lies on both sides of the Bai Causeway. The interesting name stems from the fact that (according to an ancient poet) under the bright autumn moon the lake looks smooth and resembles a mirror. In the 38th year of the Qing dynasty a picturesque pavilion was constructed near the lake. Today landscaped gardens, verandas and more pavilions have been built around this small lake, which is part of Hangzhou's West Lake. Towering over West Lake at the northwestern side of Lingyin Mountain in Hangzhou, the Lingyinshi, or Temple of Soul's Retreat, was first built in 326 AD, the first year of the Xianhe Reign of the Eastern Jin Dynasty. The 33.6-meter-high Mahavira Hall, the centerpiece of the temple, is the tallest of all the buildings with a single-layered roof and double eaves. Enshrined in the hall is a 19.6-meter-tall statue of Sakyamuni sitting cross-legged on a five-meter-tall lotus pedestal. The statue is formed with 24 pieces of camphor-wood and the pedestal is fashioned out of a single trunk of camphor-wood. As a sanctuary of 330-odd stone carvings and sculptures wrought during the Five Dynasties, Song and Tang dynasties, the Feilai Peak (Peak that Flew Here) in front of Lingyingshi figures prominently in ancient Chinese artwork. Lingyin Temple is situated on Feilai Peak ("The Hill That Flew Here"). Legend has it that an Indian Buddhist monk arrived in this area in ancient times. Believing that he recognized the hill from his native town in India, the monk is said to have asked, "How did the hill fly here?" The Temple and the area around it are lovely and cool in the summer, secluded by large trees and situated at the top of the hill with pleasant trails for hiking through the woods. There is also a good vegetarian restaurant on Feilai Peak. The Liuheta, or Pagoda of Six Harmonies, which was first built in 970 AD or the third year of the Kaibao Reign of the Northern Song Dynasty, is famed in the region south of the Yangtze River for its sheer size as a brick-and-wood structure. Standing atop Yuelun Mountain on the shore of Qiantang River in south Hangzhou, it is a representative masterpiece of ancient Chinese architecture. This 59.89-meter-tall octagonal structure has seven stories, although it has the appearance of a thirteen-floor building. The top floor of the pagoda provides a panoramic view of the rapids in the rushing Qiantang River. General Yue Fei's Tomb lies on the northern side of Qixialing Hill at the northern shore of West Lake. Yue Fei (1103-1142), a patriotic general of the Southern Song Dynasty, led his celebrated Yue Family Army in repeated invasions of the Juchen troops to recover large tracts of territory. He was framed by Qin Hui, a treacherous minister and put to death by Zhao Gou, the emperor. His name was exonerated in 1162, or thirty-second year of the Shaoxing Reign of the Southern Song Dynasty, and his remains were moved to the present site in appreciation of his heroism. In 1221, the fourteenth year of the Jiading Reign of the Southern Song Dynasty, a temple was erected beside the tomb in Yue Fei's memory. A stone monument in front of the tomb is inscribed with five Chinese characters reading, "Tomb of Yue, Duke of Song". Xin'anjiang Reservoir, also known as the Lake of a Thousand Islands, came into being with the completion of the Xin'anjiang Hydroelectric Power Station in southwest Chun'an County in 1960. With a storage capacity of 17.8 billion cubic meters, the lake covers an area of 575 square kilometers and is studded with a total of 1,078 islands of varying sizes. Ninety percent of the lake is covered with vegetation, and for this reason the place is called "Green Lake of a Thousand Islands". The water is crystal clear, the mountains that skirt the lake are richly wooded and the islands are clustered together to form a labyrinth of canals. The park known as "Tiger Running Spring" (Hupaomeng Quan) is one of the nicest in Hangzhou, filled with quaint tea houses, lush vegetation and pavilions. Legend has it that when the Great Master, Xing Kong visited Hangzhou, he bemoaned the lack of fresh water available and quickly made plans to depart. Suddenly a god appeared before him and told him not to worry as two tigers had been dispatched to deliver some fresh water. The next day, two tigers appeared as promised and the spring water flowed. The tigers were running, hence the descriptive name. The running spring still flows (although the tigers are long gone) and is now one of the most famous springs in Hangzhou. A nice break from the lake is the Longjing Tea Plantation area. Hidden away in the southwest corner of the lake are some secluded walks and the quaint village of Longjing. Longjing actually means "Dragon Well" in English and according to legend, the Dragon Well was discovered about 230AD. This fresh spring water encouraged the people of Hangzhou to develop their own distinct premium quality tea and thus was born Longjing Tea, considered one of the finest in the world. Tea is dominant here and this special type is an antioxidant with therapeutic qualities. There is no cancer among local people and they say the most beautiful women in China hail from Hangzhou. The young women dry the tea leaves and mix them with egg whites, applying it to the face as a moisturizer in their beauty regime. The Japanese also believe they get a better nights sleep using a pillow stuffed with dry green tea leaves. Whether it be drinking, picking, smelling or buying, green tea is usually featured. A trip to the village of Longjing is a 30 minute cycle ride and most of the hotels in Hangzhou have bikes for hire. Tea terraces rise up on either side of the village and it's an interesting area to walk around and watch the locals at work handpicking the tea leaves. So many places here have tea for sale that it is difficult to recommend which type or flavor is best. Prices for the tea range from USD65 for one kilo to USD275 per kilo for top grade. The best thing to do is to sample as many as you can (some of the locals may invite you into their home) and then make your decision based on personal preference. The important thing to remember when returning home is not to use boiling water to brew the tea, wait a few minutes until the water cools or it may burn the tea leaves and make it bitter. This museum of traditional Chinese medicinal (TCM) herbs is housed in the ancient buildings of a venerated pharmacy, Hu Qingyu's Hall. The museum introduces visitors to the history of traditional Chinese medicinal herbs---their origin, formation, development, application, effect, and their position in Chinese and world medical history. Samples are on display and herbs are prepared for medical use in a workshop. The reception is aptly named "Xingqutang" which translates as “Hall for Those Who Are Interested”. Hangzhou silk is prized for its tight weave and sheen. The China Silk Museum, a national institution, sits by West Lake with a floor-space of 10,000 square meters. The museum consists of the Pavilion of Introduction, Pavilion of Sericulture and Pavilion of Miscellaneous Topics, which combine to tell an authentic story about the stages of the Chinese silk industry evolving over the last 5,000 years. The museum is also complete with a department store, trade negotiation rooms for overseas buyers and a fashion show center. The Chinese Tea Museum, located in Longjinhua Township, was established in 1986 and occupies a space of 3100 square meters. It is made up of four groups of structures built in the typical style of a tea plantation south of the Yangtze River. The entire history of Chinese tea is presented in a visual format through the museum's five pavilions, which display the tea-related history, varieties of tea, tea sets, drinking services and tea-related customs and rituals. Hangzhou cuisine, one of the most popular in China, is closely related to the local culture and characterized by natural flavor, beautiful presentation and a light and palatable taste. Dishes and pastries which would have once been served on pleasure boats sailing up and down the lake remain the main staple of the Hangzhou diet, and recipes here usually contain a great deal of seafood including fish, shrimp, crab and oyster. Any dining experience in Hangzhou should include at least a few of the following local specialties: Beggar's Chicken (an entire chicken wrapped and slowly cooked in a ball of mud), West Lake Fish (vinegar coated fish from the lake), Braised Pork and Stewed Shelled Shrimp cooked in Longjing Tea. There are a few upscale restaurants in Hangzhou serving up this cuisine in pleasant settings — perhaps the best known is Louwailou Restaurant on Solitary Island, but there are other places dotted around the city. Late at night (after 10pm) the area around Hangzhou's Fish Market comes to life. This market is tucked just behind the lake on Yan'an Lu. It is a fun area bursting with life and good food. The fish is displayed in the nets at the front of restaurants and diners can select their favorite fish to eat. It is very fresh, always tasty and there is an authentic local and lively atmosphere about this place. Many of the larger hotels have elaborate seafood dinner buffets that offer a wide variety of choices; the buffet at the Shangri-La is especially popular. Hangzhou is yet another Chinese "shopping paradise". The city offers a superb collection of local crafts, rare arts and other souvenirs. Some typical Hangzhou specialties and souvenirs are Hangzhou Silk, Hangzhou Embroidery, West Lake Silk Umbrellas, Tianzhu Bamboo Chopsticks, White Chrysanthemum Tea and the world-famous Longjing (Dragon Well) Tea. One great place to souvenir shop in Hangzhou is the night market on Wushan Road. The prices are more reasonable than Hangzhou's many tourist shops. Bargaining is required, so bargain hard to return home with some great deals. Hangzhou also has a great outdoor silk market called the China Silk City (Zhongguo Sichou Cheng) on Fengqi Lu that runs for two blocks. Much of the silk is artificial (real is too expensive for most local people) but most stalls will also have some real silk on sale. If you are looking for something indoors and without the stress of bargaining, explore stores like the Hangzhou Friendship Store or the shops along Jiefang Road or Yan'an Road. Hangzhou is the capital of Zhejiang Province and has scheduled flights to and from Beijing, Shanghai, Guangzhou, Shenzhen, Guilin, Fuzhou, Xiamen, Xi'an, Dalian and other major domestic Chinese cities. In addition, Hangzhou offers flights to and from Hong Kong, Macau, Singapore and Bangkok. The airport is situated 27km outside of town. Situated at the heart of Zhejiang's highway network, Hangzhou is connected with Shanghai and Nanjing via major highways. Buses are available at the Wulinmen long Distance Bus Stop. Hangzhou is one of the centers for rail traffic in eastern China. The city is the starting point for several routes such as Zhejiang-Jiangxi, Hangzhou-Ningbo, and the Zhejiang-Changsha lines, as well as the end of the line for the Shanghai-Hangzhou service. Therefore, Hangzhou is a crossroads connected with more than 30 large to medium sized cities by direct rail lines. The train station here has recently been renovated and is a huge but efficient place. It takes about 10 minutes from the center of town to the station. Along the Grand Canal, there are pleasure boat trips to Suzhou, or down to Fuyang, Wufan, Jiande, Lanxi and other cities in Zhejiang province along the Qiantang River. In the city of Hangzhou are more than 30 bus routes. Among them, buses No. 228, No. 258 and No. 8 are all-night service, at intervals of 30 minutes. Hangzhou has plentiful taxis for hire that are inexpensive. Another nice way to get around is by bicycle. Most hotels have bikes for hire by the day.